All transactions are safe and secure with a reliable history in online purchasing behind each of our associates. 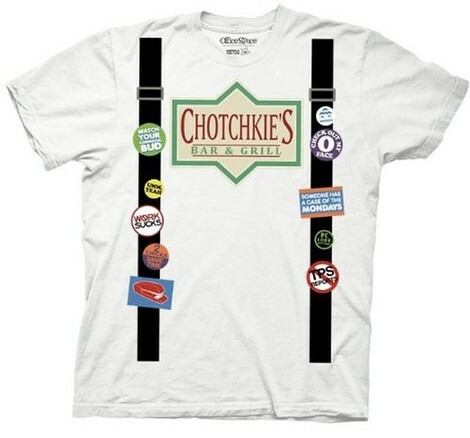 Buy the Chotchkie's Costume t-shirt to own Office Space clothing and merchandise. You won't have to worry about not having enough flair anymore. This Chotchkie's costume t-shirt outfits you as one of the employees from Chotchkie's Bar and Grill, like Joanna (Jennifer Aniston). Wear it as you recite your favorite Office Space movie quotes to your fellow employees. "I'm going to need those TPS reports as soon as possible, great." If they don't get them done, tell them that you are going to need them to come in on Saturday. In addition to the Chotchkie's Costume tee above, browse the Office Space Clothing Gallery for more apparel like men's and women's clothes, kids shirts or hoodies.